If you and your employees spend hours a day working at computers, there is an easy way to save time and resources, as well as increase productivity. It may sound excessive, but most people who have tried it, can't imagine working any other way. It involves using dual monitors. By adding a second monitor to your computer, you can avoid much of the wasted printing you now do. But that's only the beginning. Using dual monitors is a quick, cheap way to increase productivity and save paper. Suppose you are working on a document, such as a sales projection or a budget and you need to compare it to last year. You could print one and have the other onscreen, wasting paper and ink. Or you could pull up both, minimize one, and toggle between them. That works, but it's inefficient. With two screens, you can have both right in front of you at once. There is less chance of error and much less time spent going back and forth. 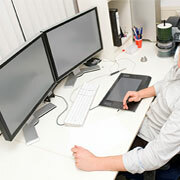 How much increased productivity can you expect by using dual or multiple monitors? Some say 20%, while others, like the American Institute of Certified Public Accountants, say 50%. Either way, the results are worthwhile. One researcher estimates that she paid for her additional screen with increased productivity the first day she converted to two monitors. Is going to a multiple monitor system worth the cost? Tech experts say the answer is yes for people whose work is heavily reliant on computers. Although most disciples of this way of working like to have similar size screens with the same resolution on each (to minimize the need for their eyes to adjust) they also admit that it's not a necessity. If your company regularly upgrades its computers, you may have extra monitors in storage. CRT monitors work fine, although they take up desk space. Flat panel screens are more compact.